If your wages are being garnished because you are facing overwhelming debt, there are different steps you can take to resolve this issue. Wage garnishment typically occurs when a creditor files a lawsuit against a debtor and obtains a judgment to have the debtor’s employer withhold a portion of his or her paycheck to be given to creditors. With the complex laws governing wage garnishment actions, you should obtain the legal guidance by calling Broward County Bankruptcy Attorney Howard Butler at The Butler Law Firm, P.A. In many cases, creditors fail to follow standard procedures for wage garnishment. If your wages have been unjustly garnished, you will need to seek the experienced legal services of Attorney Howard Butler. He can fight the order to have your wages garnished and can help you resolve your financial situation. If you are facing wage garnishment in Florida, your Broward County lawyer, Howard Butler, can help you build a strong defense to avoid the effects of this debt collection attempt. In cases where your wages are being garnished and you find it difficult to support yourself and your family, the firm can provide you with proper defense based on Florida law. If the creditor does not follow Florida’s wage garnishment laws, your defense can be backed by solid evidence. The firm understands Florida’s laws, including the restrictions on garnishing the wages of debtors who are the head of the household. If your wages have been garnished anywhere in the Broward County area, including Plantation, Sunrise, Fort Lauderdale, Pompano Beach, Oakland Park, Davie, Dania Beach, Pemproke Pines, Miramar, Coral Springs, Hollywood or the surrounding communities, call attorney Howard Butler, Attorney Butler is prepared to help you find a way out of this difficult situation. He is dedicated to helping resolve his clients’ cases. 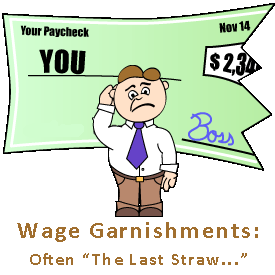 Wage garnishment can make you feel as if there is a huge weight pulling you down. Rather than accept this financial issue, develop an understanding of your legal options and your rights.